This includes reflections guided notes and guided practice. It has fill in the blank notes for the rules and characteristics and also has 8 practice problems for reflecting on the coordinate plane and applying the rules to the coordinates. 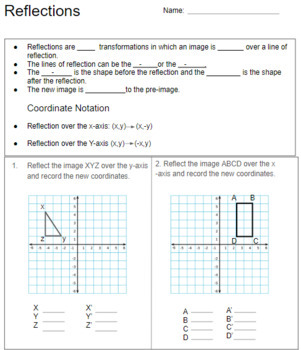 It also has a practice worksheet that has 6 graphing reflection problems and 6 reflecting using the coordinates.